American funk singer, songwriter, producer, bandleader. Born 22 July 1941 in Kannapolis, North Carolina. Seminal figure and mastermind behind bands as Parliament and Funkadelic. Not to be confused with composer, arranger and musician George S. Clinton. His son is musician Tracey Lewis. Every time I hear a track by him or any of the other P-Funk artists from Pariament/Funkadelic, I usually say "So that's where (Insert Artist Here) got that sample from". Do you want to know why they were sampled to death by people like Snoop Dogg, Public Enemy, NWA etc, because they were so good. 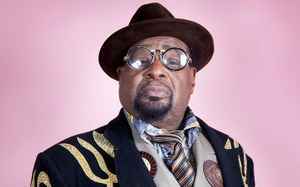 Along with James Brown, Sly Stone, Stevie Wonder, Issac Hayes, Prince etc, what George Clinton did was true funk music, uncut funk, the bomb! If we never had P-Funk, there would be no Prince, Snoop, Dre, Daft Punk or many of the classic Hip-Hop and Dance records we see today. Just the other day they transmitted the "Deep Soul" documentary on People & Arts, with many interesting aspects concerning the careers of the Soul and Funk artists from the sixties to the eighties, it was amazing. Mr. Bootsy Collins was interviewed wearing his weird-typical star glasses, and they registered some of his comments about Mr. P-Funk and his personal principles, such as 'save the Earth through Funk music'. Then, all of the sudden, the Parliament-Funkadelic lives appeared on the screen with a gorgeous space ship landing on the ouverture. What a groove! The psychedelic-funk combination of Mr. George Clinton's band was absolutely out of the ordinary, even though maintaining the essence of the elements, rhythm and sounds of the hottest Funk music! Mr. Funkenstein came out of his majestic ship, dressed in those so eccentric vestments, with his ahead-of-his-time and unusual look. George Clinton is a superb artist in the wildest sense of the term, his creations made him a revolutionnary; he was able to foresee what the others couldn't, and accomplish what his contemporaries (and descendants) wouldn't, either for lack of courage or perspective.